Hey guys i thought i would bring this to you all before my next major post next week on tuesday or wednesday. Before i go on you should know; i am on a Mac, so most of my reviews will be from a mac perspective. But, most of what i review will be available for Windows also. Im not asking you to join a side, Mac or PC. I have used both and there a good things about them both. 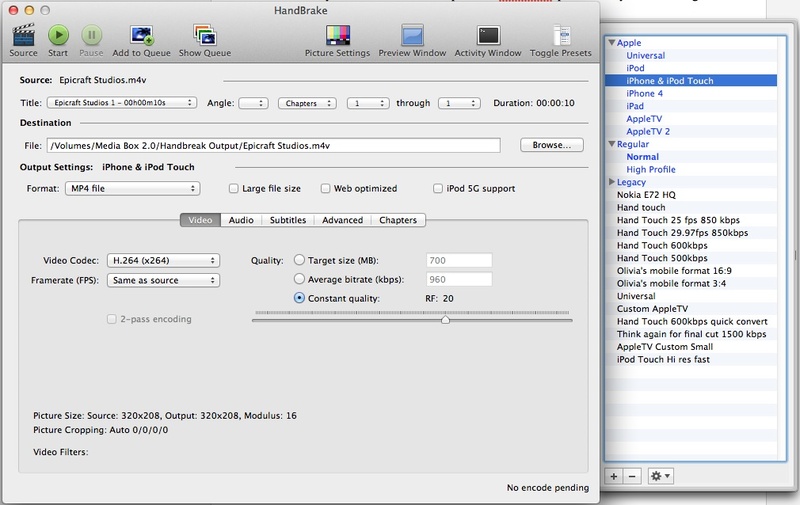 Handbreak is a free multi platform video converter. Both Windows, Mac and Linux programs are available. I like it extremely well for Mac because it comes with a 64 bit version for that platform. Now why have i brought up this freebie instead of all the other converters out there? Well, for one i love free and open source software. Secondly this converter is quite unique, simple and easy to use. Personally, I don't think its get enough love. Handbreak has provided me with an extremely fast and easy way to convert my videos to run on any platform i need. From my Nokia cellphone to my AppleTV. it comes fully equipped and ready to use straight out of the box (so to speak). The thing that amazed me is its MPEG-4 encoding speed. Its the fastest i have ever seen! Even fast than some non-free converters. It comes with some default presets which are really helpful if you don't know the right format for your iPod Touch, but it also lets you create your own presets. Have an HD movie you need converted? No problem. 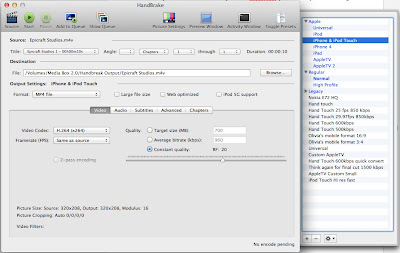 Handbreak provides easy to read settings for retaining the full video quality through the conversion. Easily change things like bit-rate to control output quality and size, or turn on auto-crop to remove extra black around the picture. 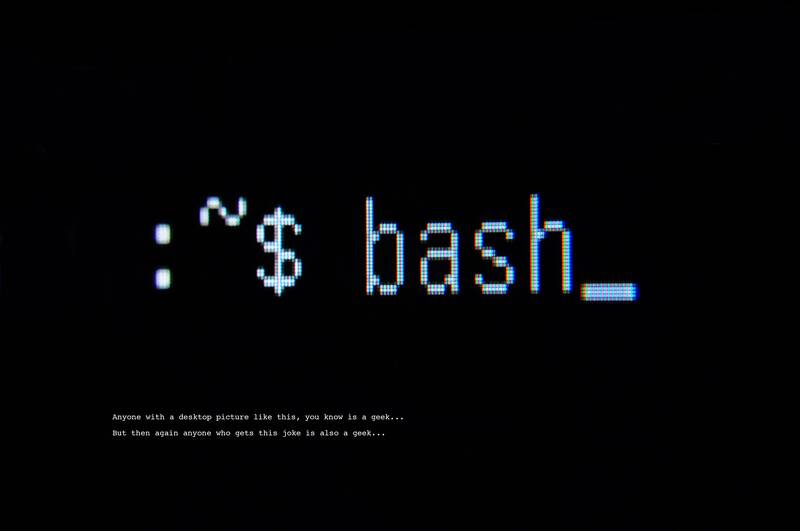 Handbreak is a "setup and let run" platform. Have a whole season you need converted? No problem. Handbreak can do it. Import the video files, apply the settings, and add them all to the queue and let them run! Note: Handbreak uses the full power of your CPU. I usually quit my other big programs (you can leave stuff like browsers and iTunes on) and just turn on the conversions while i am afk. Handbreak needs CPU power, but you will be rewarded with ultrafast conversions. To make extra sure you kept all the quality in the conversion you can check the "Double-pass" check box. This actually converts your video twice checking the data of the first conversion with the second. Good luck! Now go download this thing! If you aren't sure which settings to go with for your device, just drop me a comment i will help you out. Would Linux be ginger hair?